Some people have an affinity for purses. For me, a few options will do. Others cannot get enough jewelry in their lives. I opt for the same classics day after day. For this girl, there is one item I can’t get enough of. Yes, darling, you guessed it…shoes are the way to this gal’s heart. Shoes, in my humble opinion, complete an outfit like nothing else. You can be rocking the fanciest frock, the coolest coat, the perfect pants and yet, none of those things will be able to shine quite as brightly as they will when they are paired with the perfect shoe. Shoes are also the area of your wardrobe that you should be investing in! An expensive dress or designer handbag can immediately be cheapened by a lusterless shoe. So before you go buying all the cute “trendy” options, make sure you have those basics nailed down and ready to work for you. If you haven’t found those pieces yet or aren’t sure where to start, check out my fall/winter style guide as a great starting point! 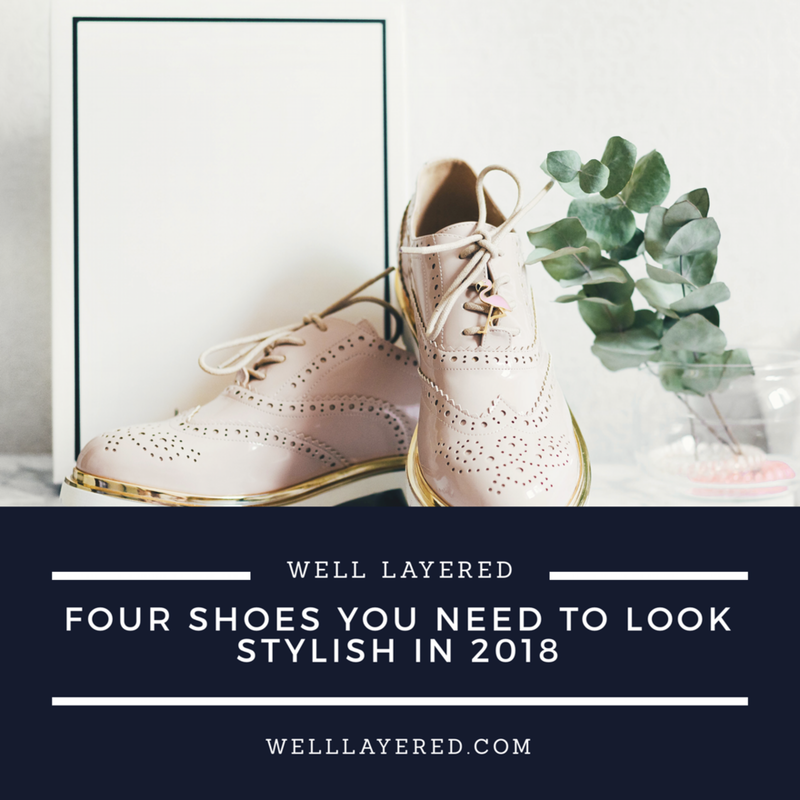 The shoes below are essential styles that I think will help to round out any wardrobe and I even break out what colors may be good first investments and which ones to focus on once the essentials are nailed down. If you don’t already have a pair, you need these, like yesterday. They will be great for the remainder of the cooler winter months but will surely be relevant in the spring. What to wear them with: In the winter you can pair these with pretty much anything but I especially like to wear mine with zip-ankle skinny pants and a great wool sweater. In the spring time when you are ready to bust out those sundresses, your chelsea boots will be ready for you! Everything has straps right now if you haven’t noticed. From flats to pumps and everything in between, this season and for the foreseeable future, strappy shoes are a great stylish investment. What to wear them with: Strappy flats can be super cute with tights and a shift dress in the winter or with a maxi dress in the upcoming spring months. A strappy wedge or heel can surely be worn in more formal settings but the right one can be dressed down too for a casual date night. Patent leather has perennially been left to formal occasions and workwear, but no longer! Patent adds a lovely glossy finish to any look day or night and when applied to a more casual shoe option (like a loafer or a sneaker) can elevate an everyday outfit. What to wear it with: To get more wear out of your patent footwear, select pieces that you can wear for all occasions! My all-time favorites are my Ferragamo Vara low heel pumps. I invested in these for my wedding and now wear them for work on the regular! I also recently purchased white patent booties which are a fun way to add high shine to an everyday look with skinny jeans and a chunky sweater. Women’s fashion has always taken hints of inspiration from the boys and footwear is no exception. The women’s version of the oxford is having a moment right now and I think much like the jumpsuit “trend” a few years ago, this current style has major staying power. For good reason too…the oxford is super versatile and adds a grown up refresh to your shoe arsenal. What to wear it with: For the winter months try with a menswear-inspired straight leg pant or oversized blazer. In the spring a more masculine style oxford is a fun way to play with a super girly sundress or mini skirt with tights. Make sure to stay up to date on all the awesome style news and blog posts with Well Layered by signing up for the newsletter which goes out every few weeks! How To Get A Confidence Boost With Your Perfect Swimsuit!